If you couldn’t make it to the Newhouse School for our Hacking Journalism seminar with Dan Schultz, you’re in luck. Watch the recorded live-stream below. You can also read live coverage in Twitter and social media on Storify. Our second Digital Edge Journalism seminar is scheduled for Feb. 6 and will feature Dan Schultz, who will be talking about “Hacking Journalism.” He’ll be speaking from noon-1:30 p.m. in the Joyce Hergenham auditorium in Newhouse building 3. Please RSVP on Eventbrite so that we can plan for space. Light snacks will be provided for those who RSVP and bring their Eventbrite tickets. Technology is changing all media, including journalism, but the fact is that most journalists can only get so far on their own. Creating something that is truly unique and innovative in the digital sphere requires working with a developer. But where are these mythical developers, and why would they work on journalism when they could work at, say, Google or NASA? Believe it or not, more and more developers are choosing journalism as a profession for a simple reason: they want to do something that makes a difference in the world. They call themselves hacker-journalists, and this is your chance to meet one. 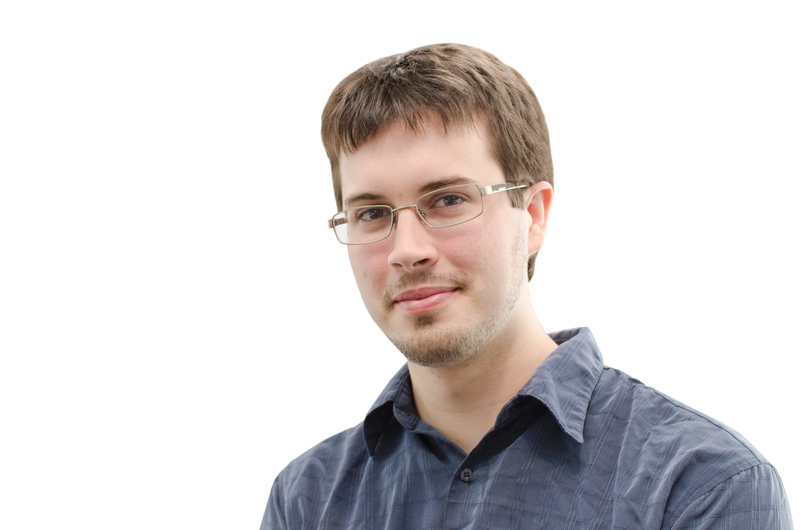 Dan Schultz is an MIT Media Lab grad who is currently completing a Knight Mozilla OpenNews fellowship at the Boston Globe. His recent projects include Truth Goggles, which compares news stories with PolitiFact articles in real time to determine if a statement is true or false; and ATTN-SPAN, which watches C-SPAN for you to create personalized episodes about what your representatives said in Congress. In this seminar, you’ll get to see Dan’s creations in action and get tips for how to convince coders to apply their skills to journalism. And who knows, you may even learn a little programming so you can hack the news yourself. The Syracuse local and campus media attended our Drone Day presentation on Jan. 23, watching our presentation about drones in journalism and the demonstration of our drone. Here are links to the coverage. Drone Week continues here at Journovation. Remember, this Wednesday (Jan. 23) is the first of our Digital Edge Journalism Series. Starting at noon, Dan Pacheco will be talking about and demonstrating some of the ways drones can be used in journalism. We’ll also be flying our own drone and giving details about our Win a Drone of Your Own contest. (Don’t forget to sign up here. There’s food, too!). One of the parts of our contest is coming up with a potential news story in which drones can be used. 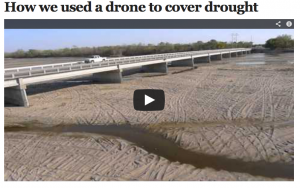 To get you thinking about stories you may want to pitch to us (or do in your own career), here are some examples of how drones are being used in the journalism world. 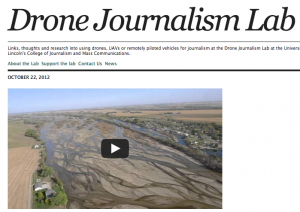 We start, as always, with the University of Nebraska-Lincoln’s Drone Journalism Lab. 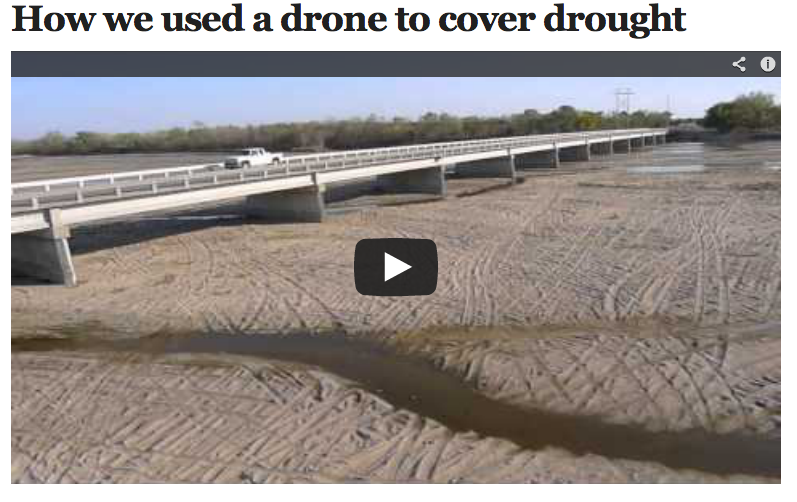 They used drones to cover the devastating droughts that hit the midwest in 2012. Professor Matt Waite has been at the forefront of the use and research of drones in journalism. 60 Minutes also used a drone to get some otherwise hard-to-get footage of the half-sunken Coasta Concordia, a passenger ship that ran aground in Tuscany. In addition, the Occupy Wall Street Movement also used a drone – the same Parrot ARDrone that we’re using and giving away – to get a live feed of the 2011 protests. With the first in our Digital Edge Journalism seminar scheduled for Wednesday (sign up here) focusing on drones in journalism, we’re turning the next few days into Drone Week. 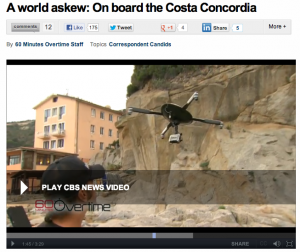 It’s like Shark Week, only … with Drones. Over the next couple days, stay tuned to our site and to our Twitter feed for stories about how drones are being used in journalism, about the research that’s being done and about the ethical factors that go into the use of drones. Our latest Journovator Spotlight falls on a group featuring a pair of our own graduates from the Newhouse School – The Bly Project. We caught up with the founders at Spot Coffee in Rochester. You can watch the interview here (apologies for the coffee making in the background). To get things moving, they created a pitch on Kickstarter that attracted $3,895 from 92 backers. They then used those funds to travel across the country, starting from their home in Rochester, N.Y. and culminating in Austin, Texas. They interviewed people along the way about what the American Dream means to them and compiled them into a series of multimedia stories that you can read on The Bly Project site. Election Day is always one of the most exciting days in any newsroom. The rush of breaking news, the crunching of data late into the night, covering stories that matter to the country and to your community, make it one of the most exhilarating days to be a journalist. And with the growth of digital news, it’s become one of the most exciting days to be a news consumer. Following on our list of the most innovative coverage of Superstorm Sandy last week, we’re gathering a list of the most innovative and interesting Election 2012 coverage. This list is by no means exhaustive and it is very much a work in progress, so if you know of anything innovative or interesting, please let us know and we’ll do our best to add it. UPDATED Wednesday, Nov. 7, 10 a.m.
WNYC/PATCHWORK NATION: In all forms of media, we see a lot of forms of the red state/blue state map. WNYC, partnering with Patchwork, did it one better. This map breaks down election results not just by county, but also by the demographic features of counties. It’s an incredibly rich map of data that goes beyond the simple version we usually see. Huffington Post Live Results: Live results from The Huffington Post. Dan Pacheco, our boss, reports that this worked great on an iPad. New York Times on shifting demographics: For being the most traditional of “traditional media,” The New York Times is doing some sensational work with multimedia presentation and data analysis. This feature shows how different demographics voted on Tuesday. It’s a visual representation of how Barack Obama built his base of support to win the election. The Washington Post did a similar feature. New York Times Swing State Picker: Leading up to today’s Presidential election, the New York Times has a great graphic involving the swing states. 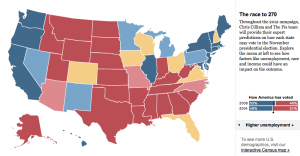 Pick the winners in each states to see the updated scenarios for Barack Obama and Mitt Romney. The Washington Post’s 2012 Election Map: The Post is providing not just state-by-state information, but county-by-county. Click on any state, and then you can pick a county to see how it voted in past elections as well as live results as results come in tonight. There are maps also available for senate and congressional races. Video the Vote: One of the big issues so far this election have been accusations of voter suppression. This site encourages voters to document any alleged incidents by taping them on their smartphones and posting them to this site, creating a real time document of the allegations. My Fair Election: Long lines and long waits at the polls have been a defining feature for many early in this election. My Fair Election asks people to report their experiences, in the hopes of being a database for reporters and others interested in making elections better and more transparent. Huffington Post Twitter list: The Huffington Post has collected 270 (the magic number in Presidential elections) Twitter feeds that are covering the election. This is a fantastic place to start to get the most up-to-date news on social media. Knightlab Tweetcast: This is pretty neat – the Knight Lab at Northwestern University has created an algorhythm that lets you predict how you (or anyone else) will vote by analyzing that person’s Twitter feed. Simply plug in the user name and see who they will presumably vote for. Real-time election infographic: This is a live infographic from Salesforce based on social media conversations, monitoring what topics people are talking about right now. Electiongrams: One of the big things we’ve seen in the past few weeks is the rise of Instagram as source for real-time photojournalism of breaking news stories. For the election, NBC is aggregating instragram photos from users and is sorting them by state. Similar projects are being done by PBS and by Foursquare (Big thanks to Jeff Sonderman at Poynter for writing these up earlier today). One note: It may be illegal to publish a picture of your ballot. USA Today Twitter Election Meter: Think of this as like a real-time measurement of Twitter discussions. From the site: “The Twitter Political Index is based on gathering the volunteered opinions of people logging on to Twitter. The result is analogous to describing the general tone of political discussion overheard in a café on a given day.” You can view the results either nationally or in swing states. Storify the Election: It’s no surprise that Twitter was insanely busy last night. This aggregation of last night’s tweets is effective in its thoroughness. Facebook Voting map: If you’re on Facebook, you had the chance to click an “I Voted” button when you logged in on Tuesday. Facebook aggregated that data into a map, showing the number of people who voted and broke it down by state and gender (among other variables). Star-Tribune preview page OK, so print is far from innovative these days. But we can’t ignore good things that are happening in print, and the Star-Tribune’s election preview page is as good as we’ve seen. Democracy in action: We at Syracuse University are very proud to be a part of Democracy In Action, in which college students across the country are doing original reporting and telling stories of the 2012 election. Students are doing a variety of reporting styles (multimedia, social, traditional), and we wanted to give them their due.They’re also doing a live stream through Scribble. By now you’ve heard of the SU Student App competition (http://idea.syr.edu/funding/su-app-competition/), which has a new Journalism Innovation category with a $500 prize. The deadline for submitting ideas is Nov. 9, and your mobile product or app needs to be ready to demo by November 28. Creating multimedia eBooks using Apple’s free iBooks Author tools. Creating a WordPress site with a mobile-friendly theme.